The aim of this book has always been to give guidance on the diagnosis and treatment of ocular motility disorders based on clinical experience, as opposed to a comprehensive treatise on the subject drawn from the primary literature. The Third Edition sees a new team of authors who have kept very much to this priniciple in their nevertheless thorough revision of the book. Whilst there are no new chapters as such, the immediate impact of the revision is in the improved page layout with increased use of diagrams and flowcharts. There are new sections on feigned visual loss in adults and children, the management of residual defects and the section on botulinum toxin treatment in chapter 8 will be re-written to take account of the great advances in this form of treatment. 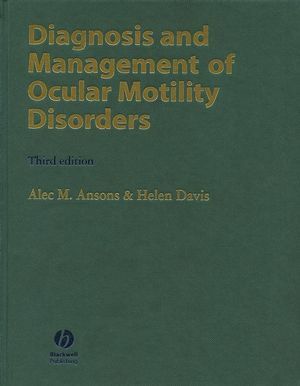 Alec M. Ansons and Helen Davis are the authors of Diagnosis and Management of Ocular Motility Disorders, 3rd Edition, published by Wiley. Section II: Principles of management. Section III: Clinical features, aetiology and management of specific disorders. 11 Introduction to Concomitant Strabisms. 15 Microtropia and allied conditions. 16 Heterophoria and anomalies of convergence and accommodation. 18. Introduction to paralytic strabismus. 21 Mechanical restriction of ocular movement. 22 Supranuclear and intranuclear disorders. "The sections on ocular movements, ocular deviation and binocular function are excellent; they are concise, brief, practical and are evidence of the authors' practical and commonsense approach... The middle sections on non-surgical and surgical management follow in the same concise manner and I was very impressed with the clear description of complications and the suggestions that were made about the management... It is an excellent book and it deserves to do well as it is destined to!" "This is a comprehensive text that will appeal to all orthoptists (undergraduates and postgraduates), opthalmologists and other opthalmic professions with an interest in binocular vision. It is an essential text for orthoptists as part of their departmental and personal libraries."